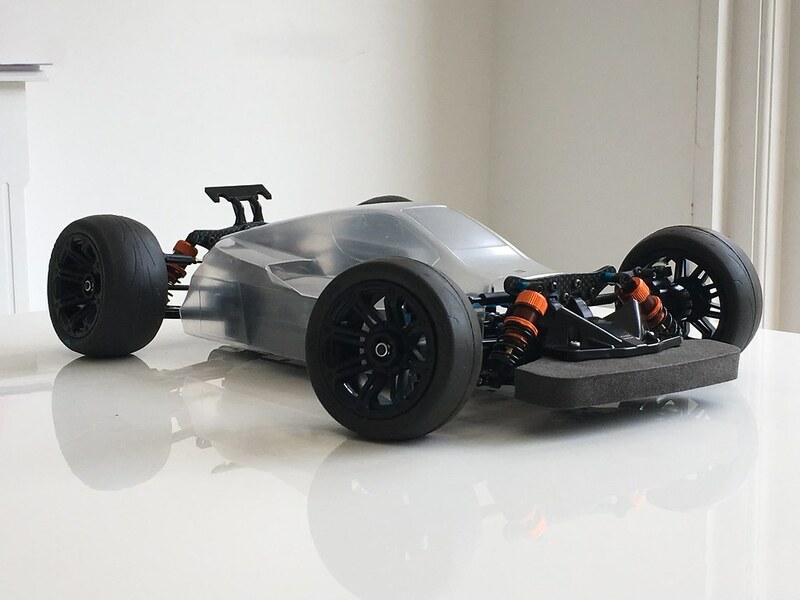 Hi all, so am posting here with my ‘experiment’, a road going TT02B, modded to be a low ride height asphalt race car. 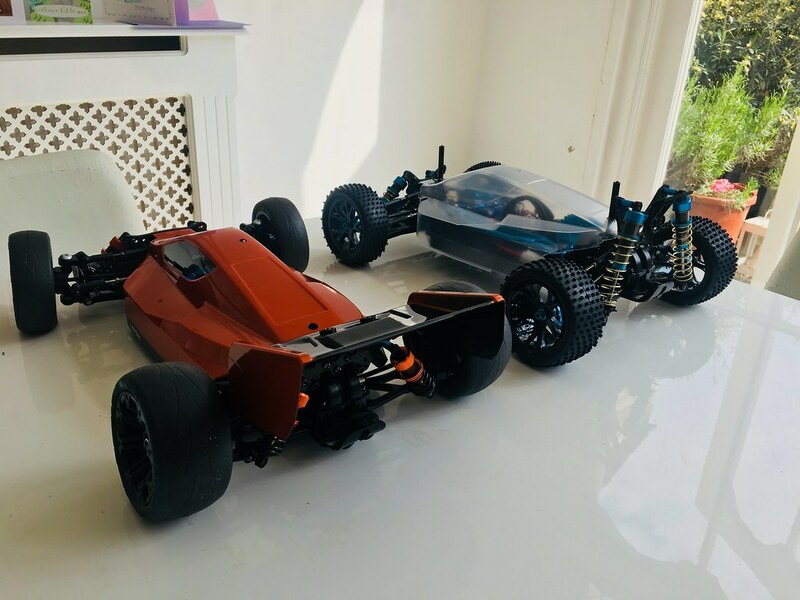 So this isn’t a proper build thread, more a ‘build notes’, with some pics of the car and some interesting mods along the way. I won’t go through all the build steps. 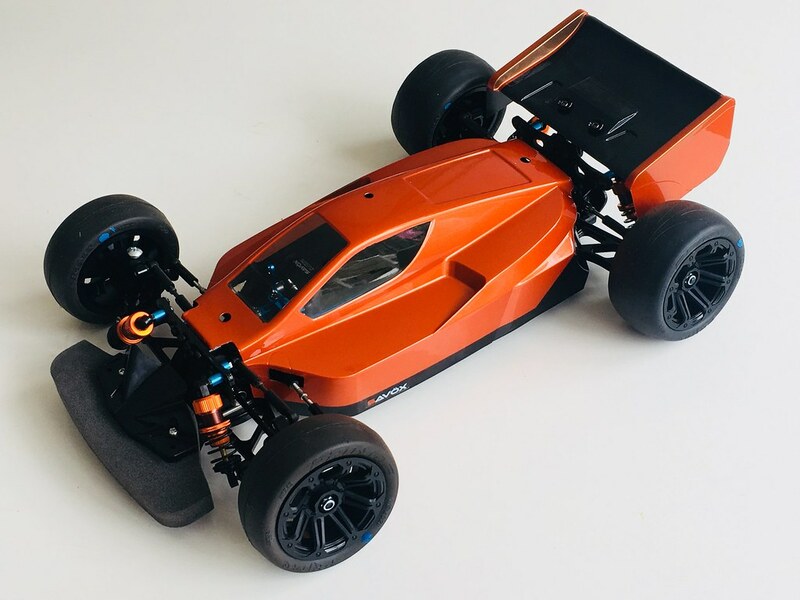 I was really keen to see what could be done with the TT02B chassis, given that it has been developed as a dual road and off-road platform, by using the B-spec version, but making it on-road. 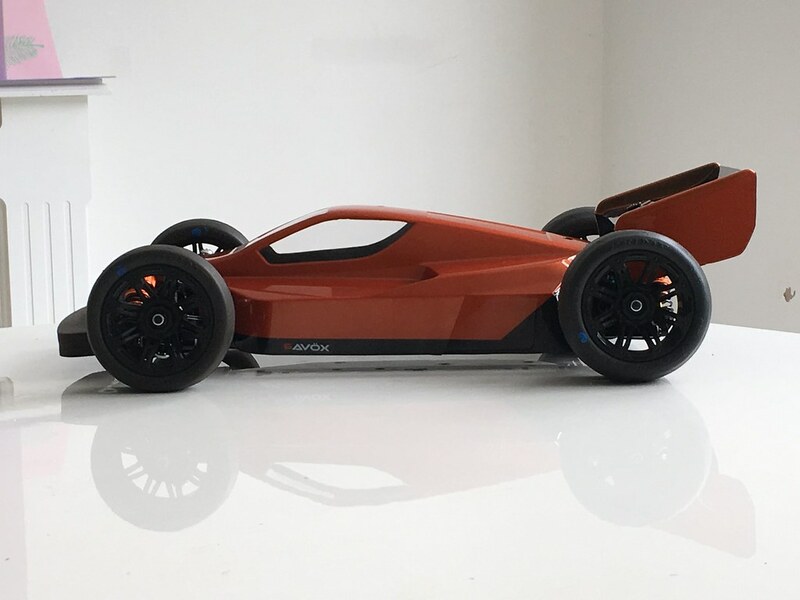 Essentially I like the idea of using the longer arms and the bigger wheels and track from the buggy spec, whilst trying to turn the car into a low centre of gravity, relatively stiffly sprung, on road racer. 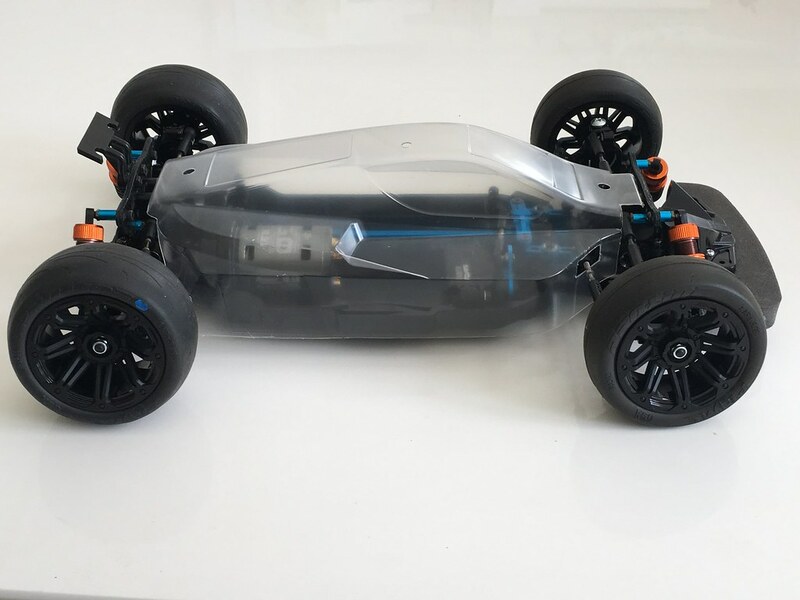 I was googling TT02B road going versions and I found one guy who had done an MS with home made aluminium damper plates to drop the car low. So it had been done, now I could properly commit to the project. So this car has some tricks to it. 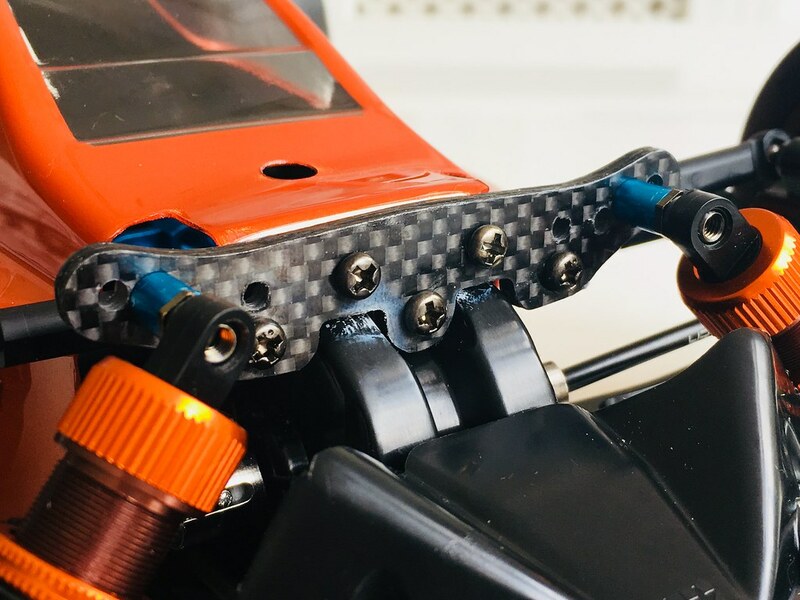 The primary modification is to the damper plates. 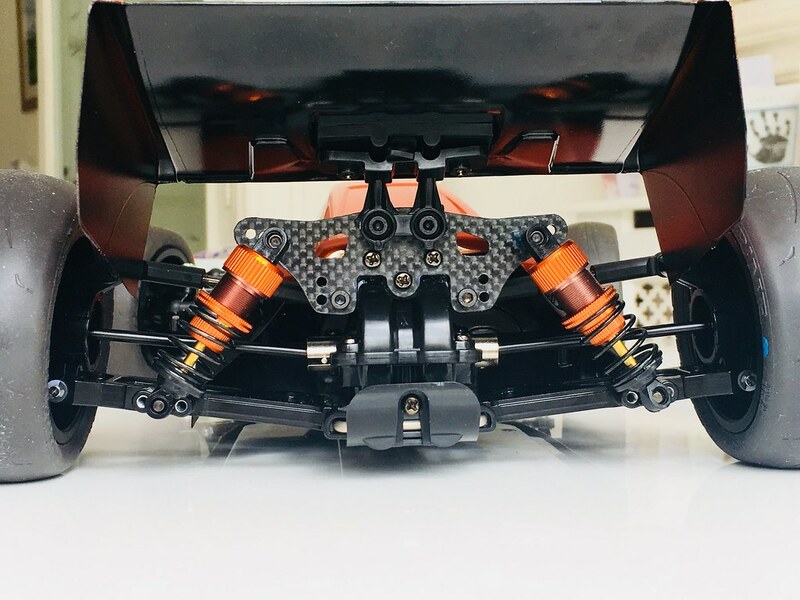 I needed to drop the car to have about 8-10mm clearance. 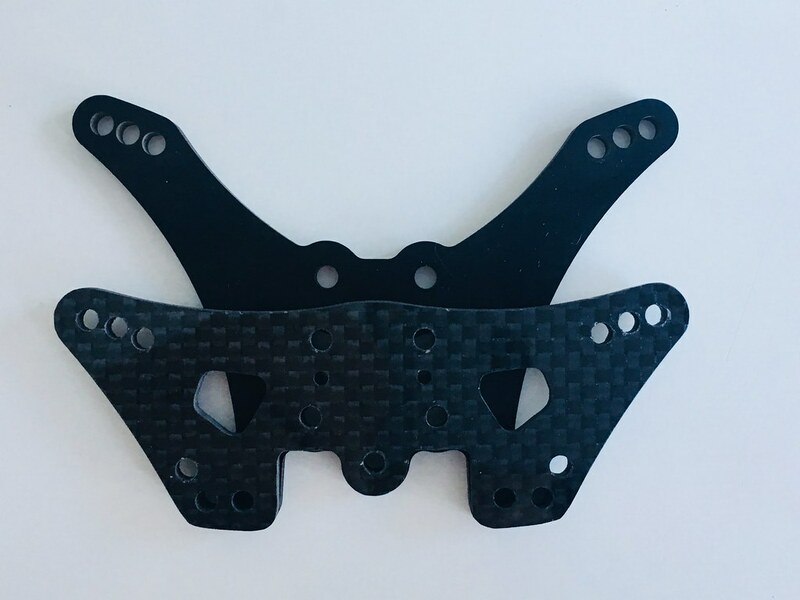 I did lots of measuring and eyeball calculations, and developed some drawings to send to Fiber-Lyte in the UK, who can cut bespoke carbon fibre pieces. 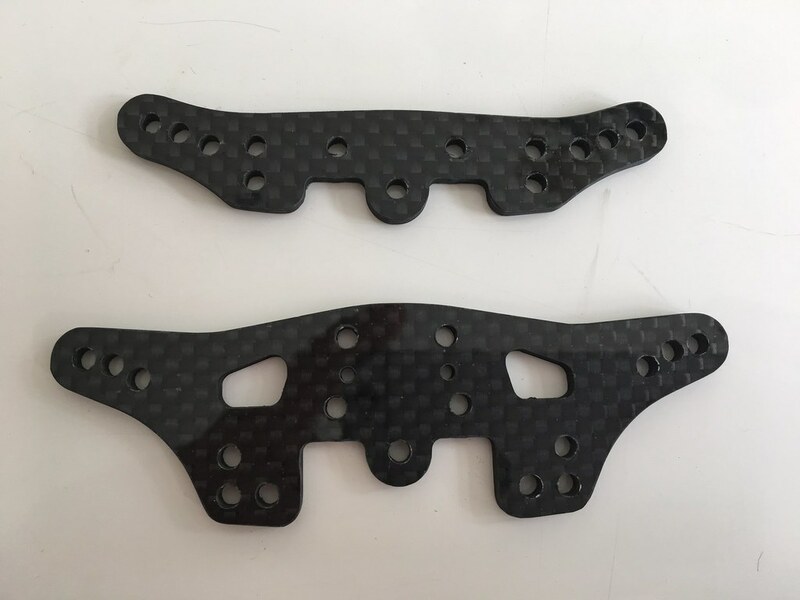 This is measured from the FRP plates of the TT02B MS kit damper plates. 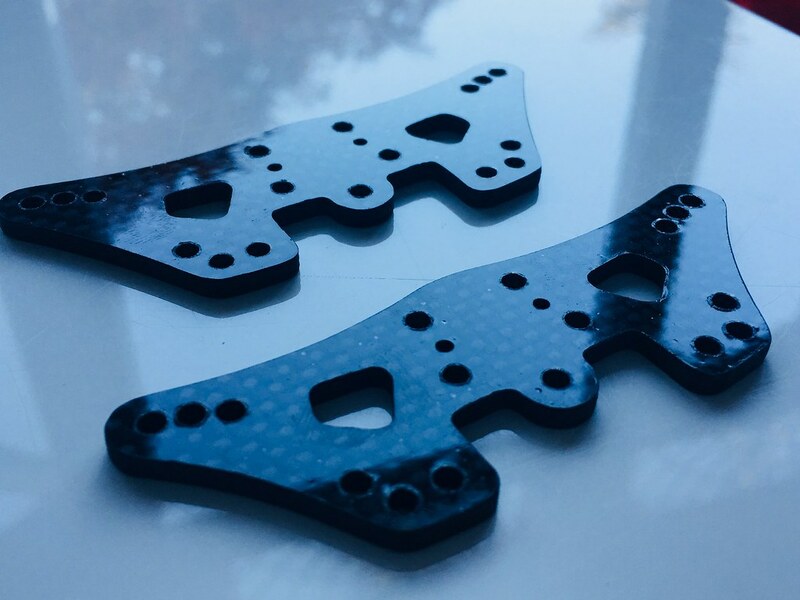 Pictured above are two variants of a rear damper plate with a 22mm drop from the standard buggy damper mount holes. 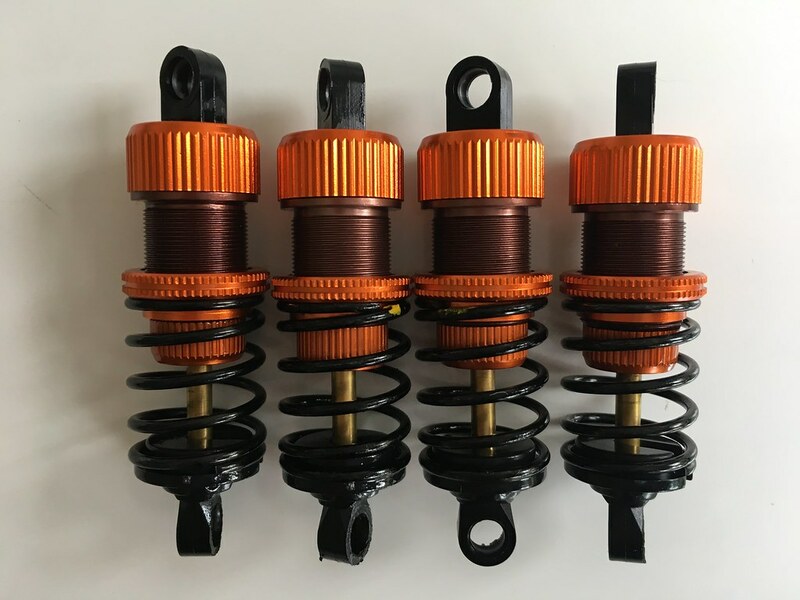 I planned to use 55mm shocks on all four corners, these orange aluminium ones from Yeah Racing. Yummy - shiny orange! 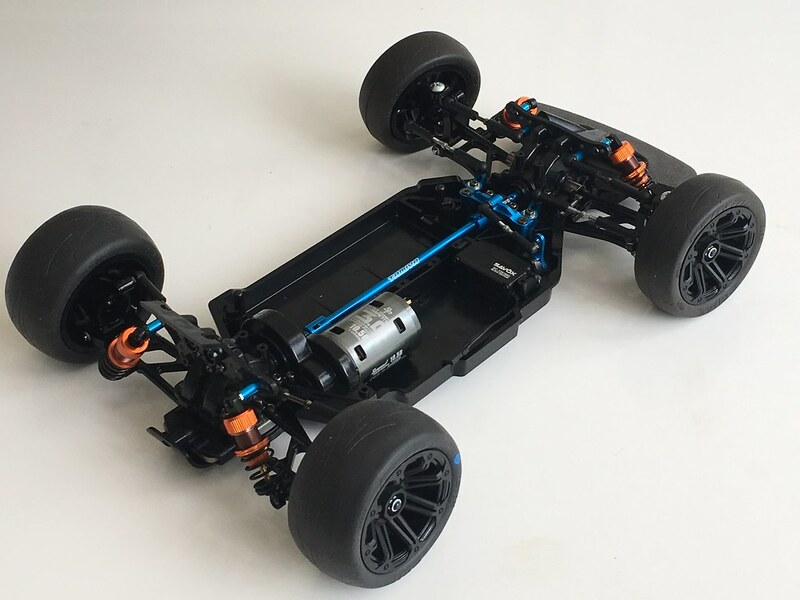 They were a good build and quality, compared to to the mighty Tamiya. These came with a range of spring settings. The ride height looked good, about 14mm rear and 10mm front. If this is too low even for a beautifully flat piece of asphalt and I can increase this later. 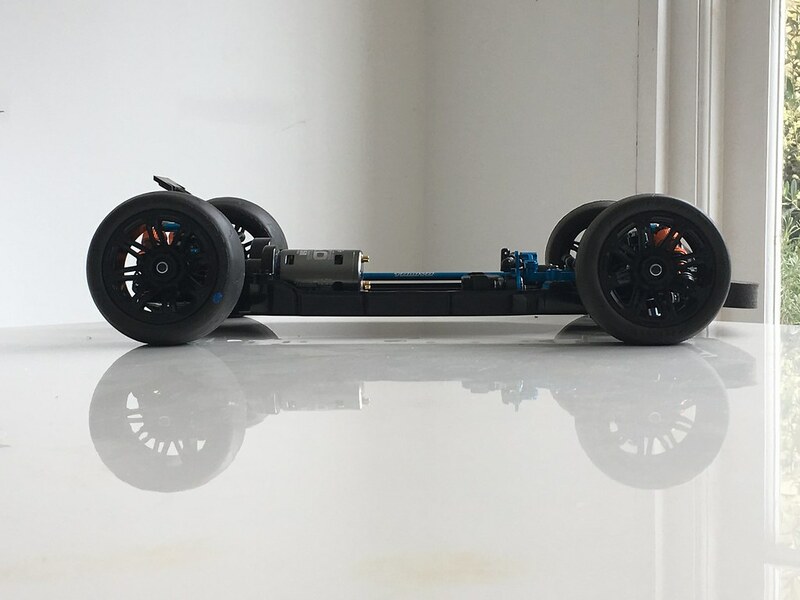 I used black aluminium lower arms from GPM Racing - I know metal arms are not good for buggies, but I figured this was a road car so perhaps stiffer, less flexible arms might be ok! 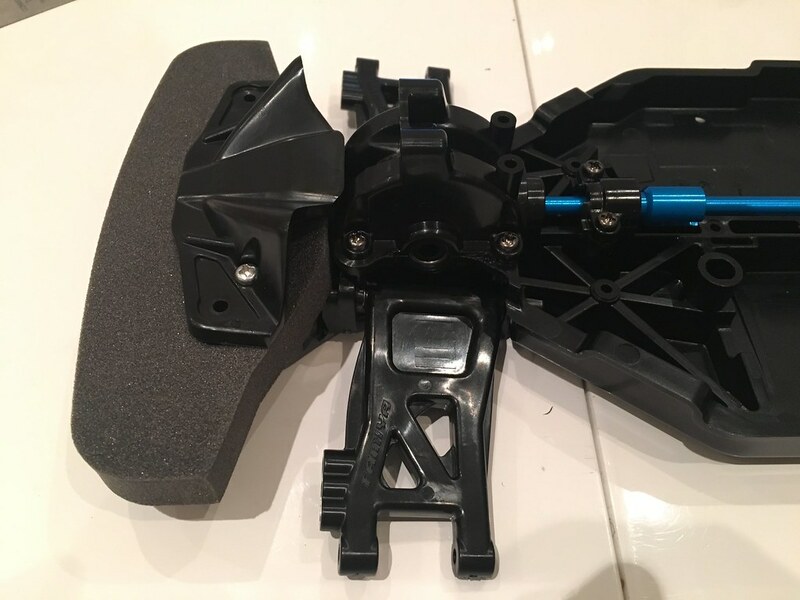 You can see a TT01 foam bumper plate fitted to the front. I used a standard mounting components, but had to get creative with how it all fitted together - a bit of dremel to the clamp and to the chassis, and some longer screws, which I’ll need to replace with flatter heads. Originally I had been wondering if I’d use this foam as the base for some sort of front wing. Will get onto that later. It gives the car a bit of balance and hopefully some protection. 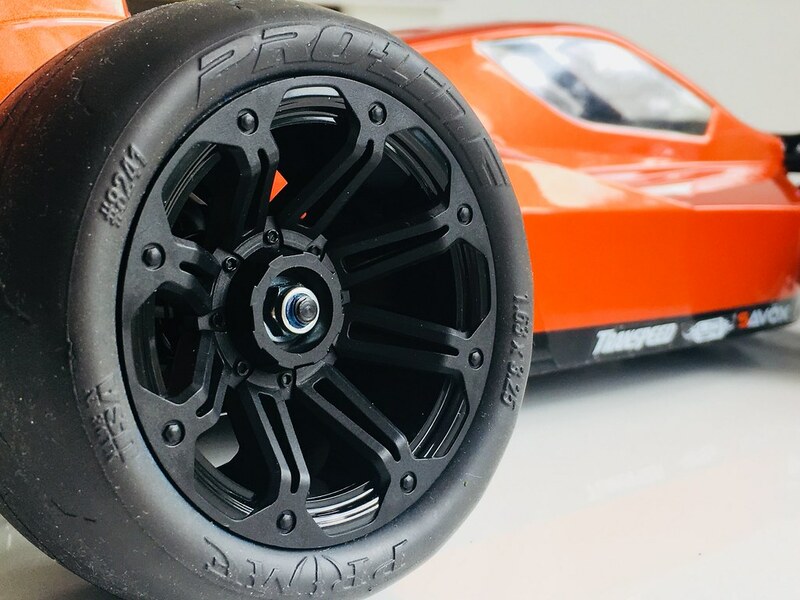 To keep the car in a ‘formula’ concept of racing chassis, I found these Proline Prime ‘slicks’ tyres, which are smooth and super grippy. These are for buggies for high grip internal use, if I recall correctly, hence 2.2inch diameter. 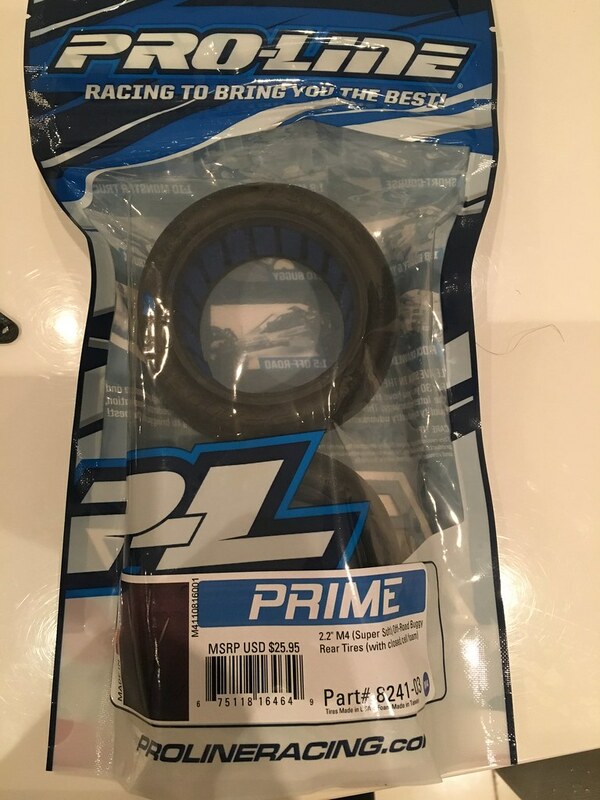 They are intended for 4wd, so a set for rear and a set for front were ordered. So here is a few shots of the first test fitting of the body. 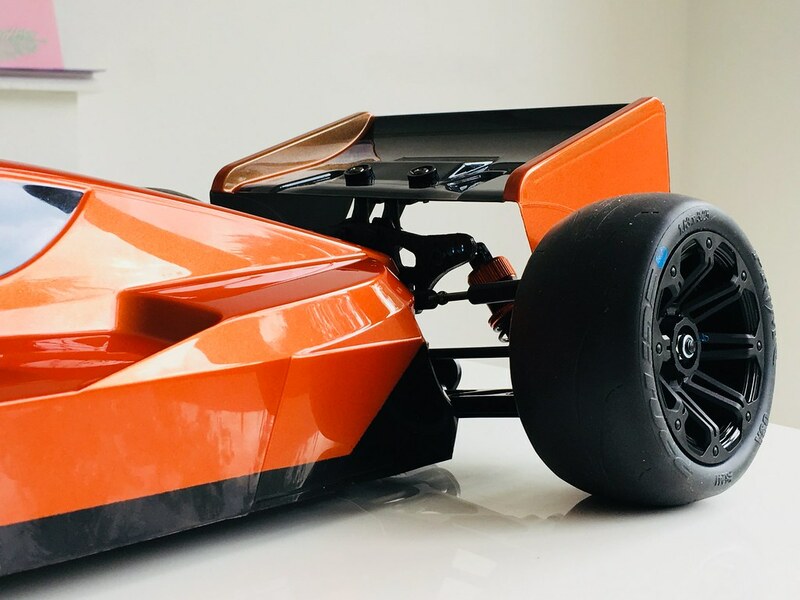 I had some particular modifications or ‘amendments’ that I had to figure out ahead of time, to ensure clearance and coverage were retained, and to maintain a ‘formula’ racing appearance. I made the most significant amendment to the front end. 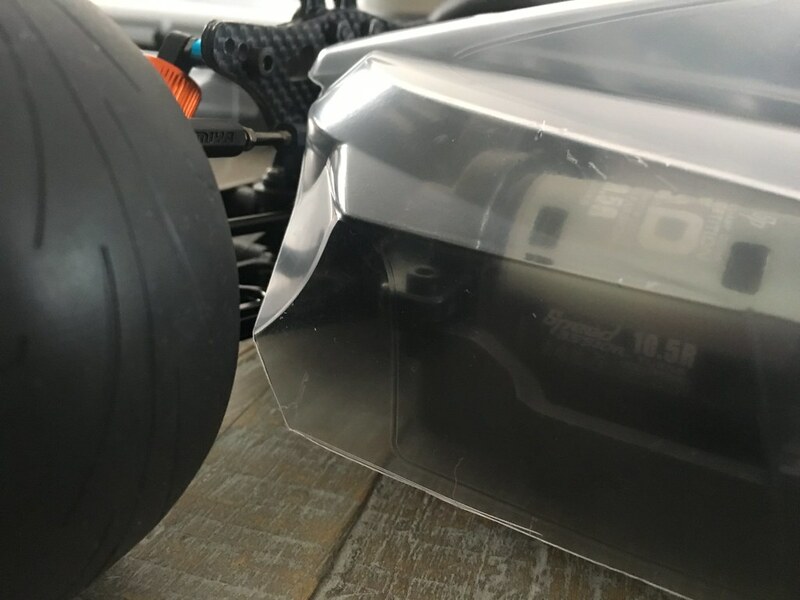 I hate the way so much of the front of the TT02B shells are cut away. 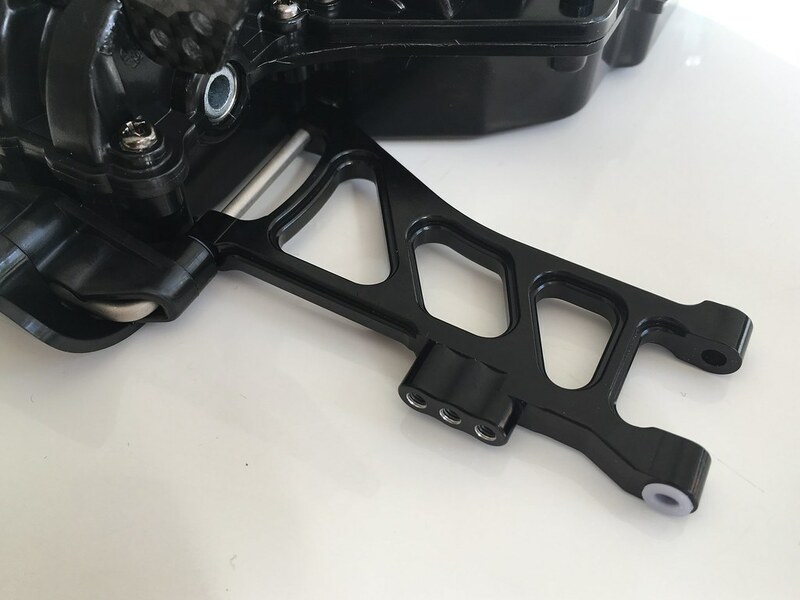 Clearly this is for clearance of suspension, steering, upper link arms, etc. 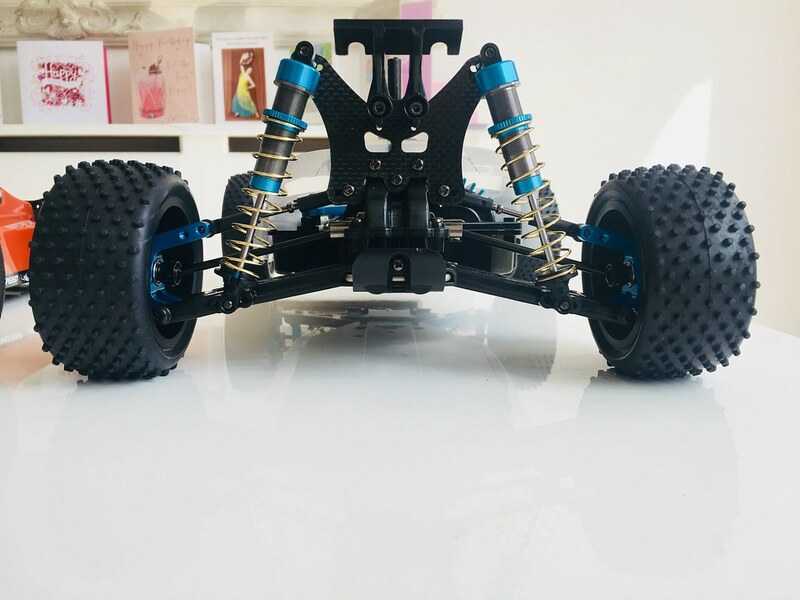 However, with so little suspension travel anticipated on this build, I could hopefully retain a lot more of the shell and keep it more tightly packaged at the front of the chassis. 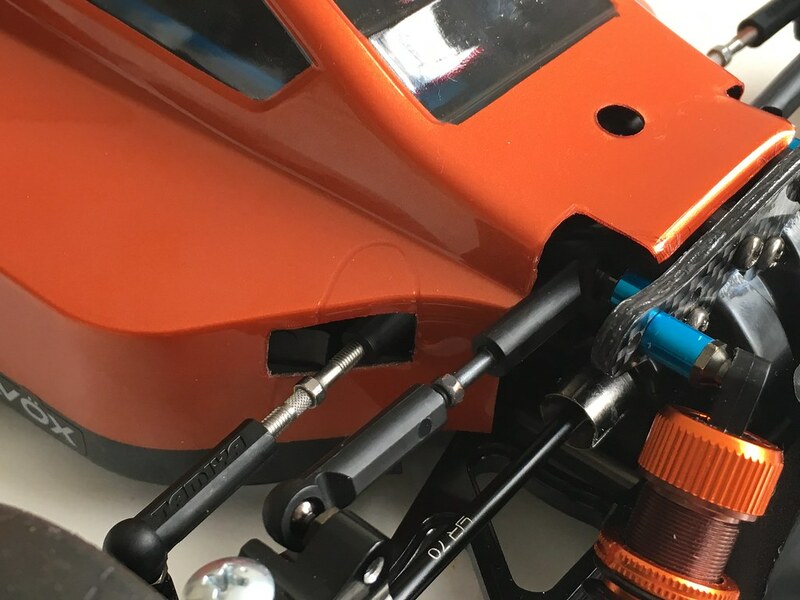 The keen of mind amongst you will instantly spot that the steering link needs to be detached at one end to be able to fit the shell! 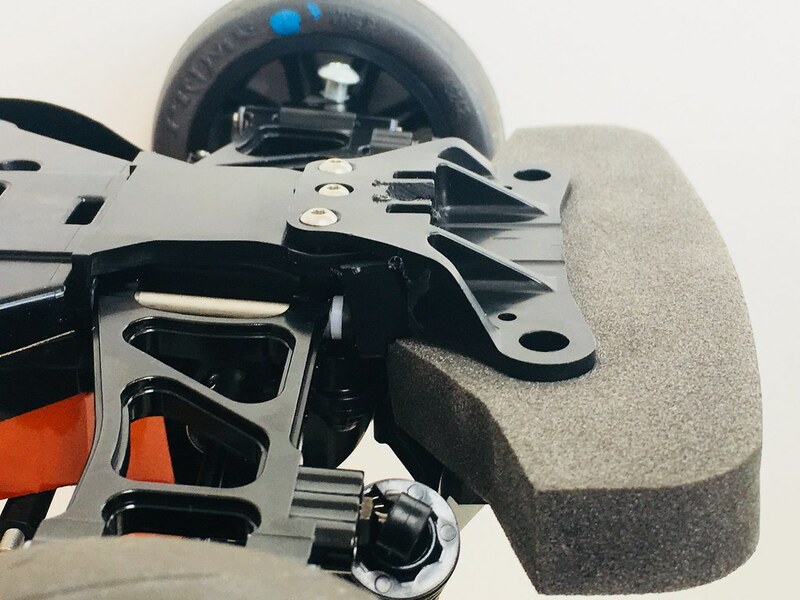 The height, size and position of the steering aperture was calculated and measured over and over again to ensure clearance of the steering arm across the whole steering range and suspension travel. Side view of the shell fitting. 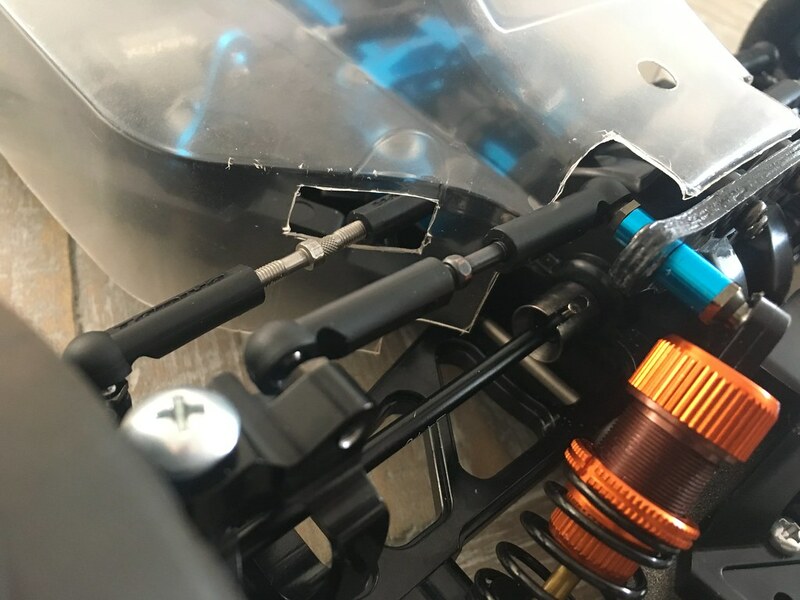 I intended for the shell to sit further forward and lower onto the chassis, therefore I can’t use the pin body mounts as they would not align to the body holes. I’ve therefore got some Velcro tabs mounted to the inside of the shell to allow this fit. At the rear end, I also left more shell intact, again to keep the body more tightly packaged to the chassis. I will have to consider airflow and cooling a bit down the line, given that this shell is much tighter than normal. You can see the ridge for the stock cutting line. That’s about it for the mods andcammendments. The following pics show the car with painted shell, not yet stickered and decalled. I will need to think hard about decals, I might design some and print them via MCI Racing. I agonised for ages over the colours and design, looking at many F1, Le Mans, GT3 and endurance racing liveries for inspiration. In the end I chickend out of anything too complex. Originally I thought it came out too dark, but it’s actually grown on me and looks fab in bright sun. 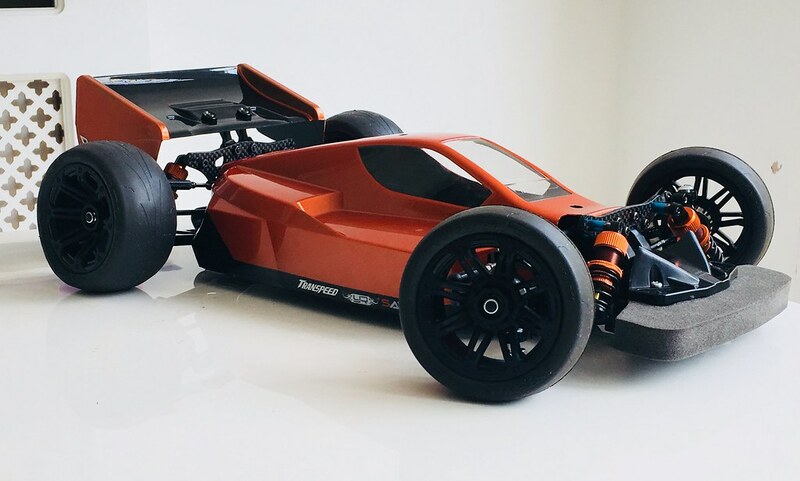 I still want to try a more complex ‘racing’ paint scheme in the future however, I feel I missed an opportunity. 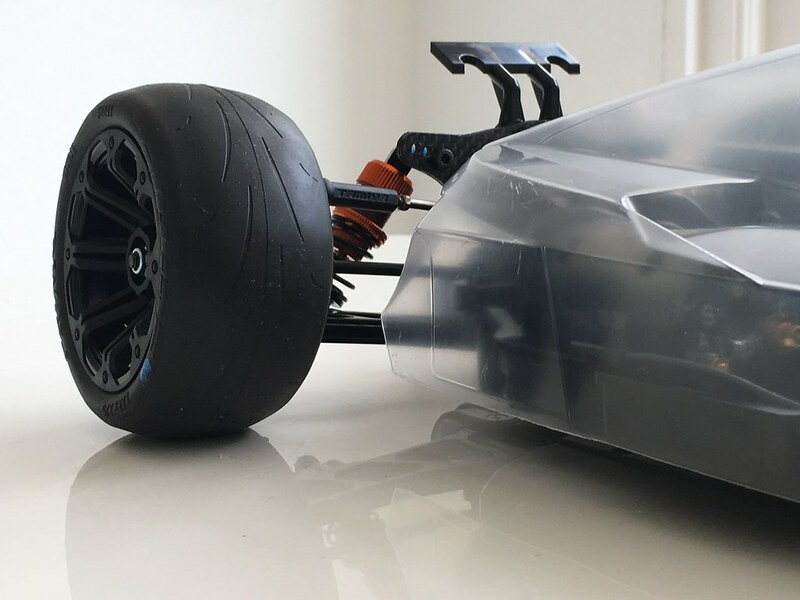 I left a lot more plastic on the rear wing, to increase the size of the side face. 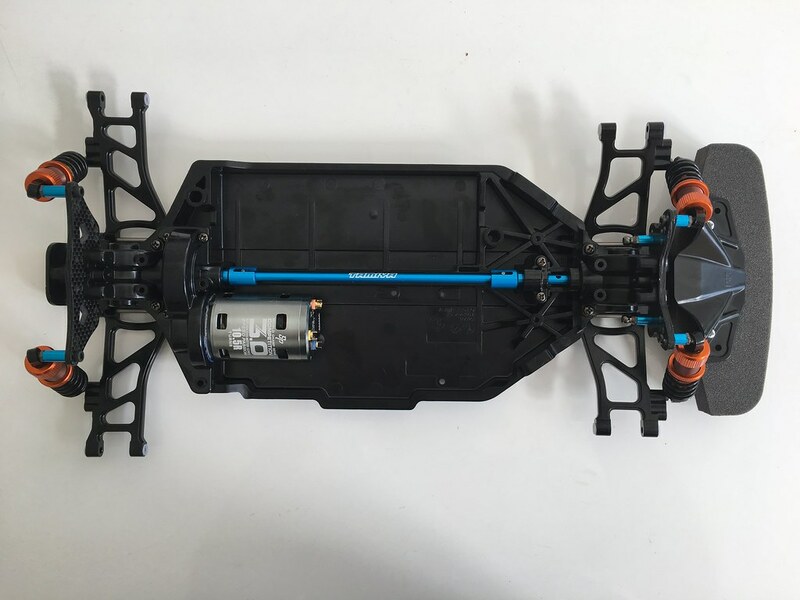 This also clearly shows the rear dampers, damper mount, shocks, arms, universals, and ride height. 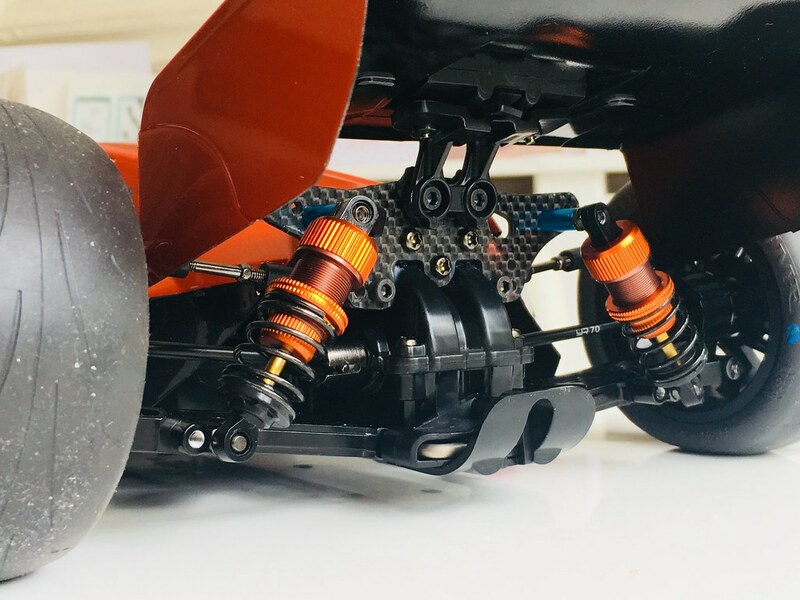 I’m using plastic rear hubs for now from the stock kit, will replace with black aluminium ones when they arrive. 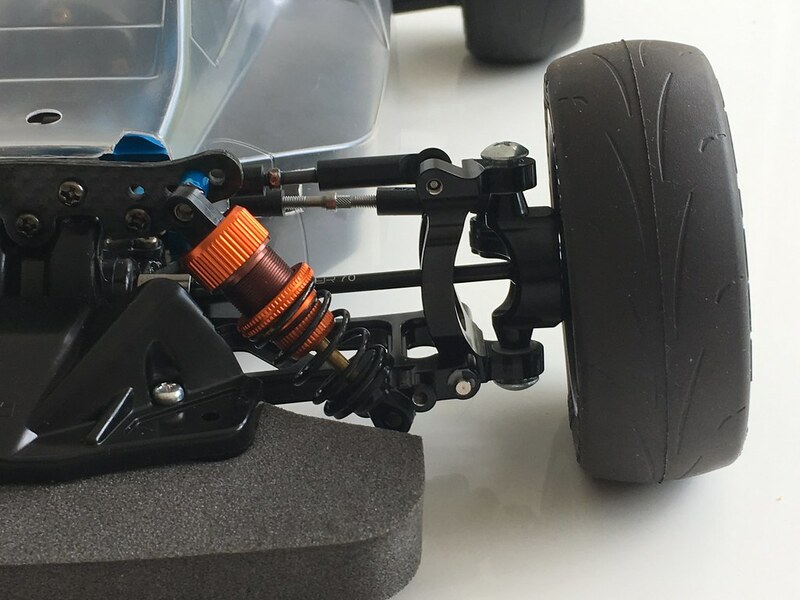 The Proline tyres are fitted to Kyosho Fazer black FAH203BK and 204BK wheels front and rear. Hopefully this will be a good combo. Need to glue thectyres before running. 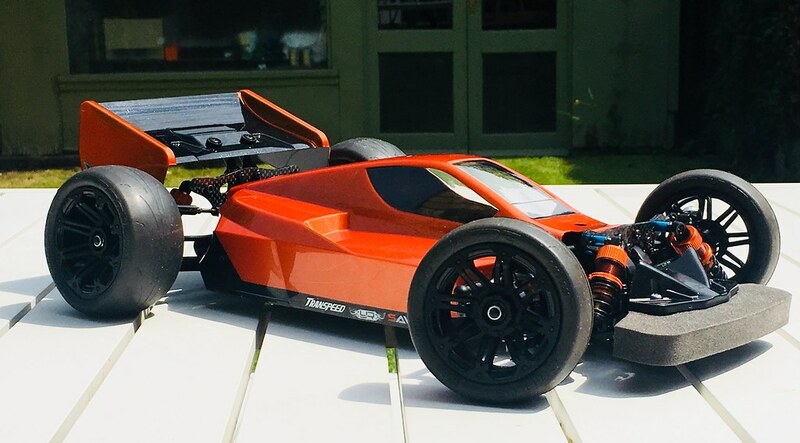 So that’s all for now on this experiment in this ‘Formula Neo Scorcher’, will post back when decals are done and with a run (when I find time to go out for a run with this and other cars...) . It’s been amazing fun so far! Sometimes the simplest paint scheme looks the best and I think you've absolutely nailed it. Fantastic looking car. Makes me want to build one too. Loving this! Looks great! What wing did you use? Neo Scorcher? 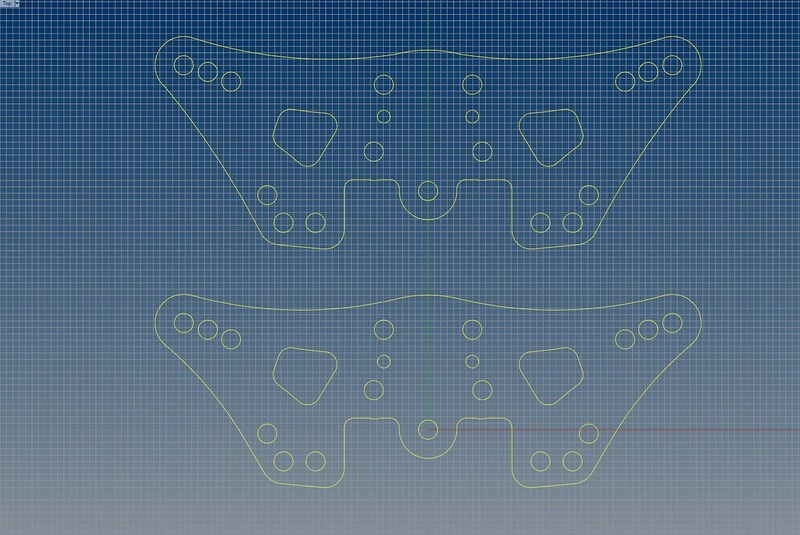 Yeah this is a standard Neo Scorcher wing, however I didn’t cut it to the shape that the ridges and the manual specify, I left the side planes bigger by cutting away less lexan. 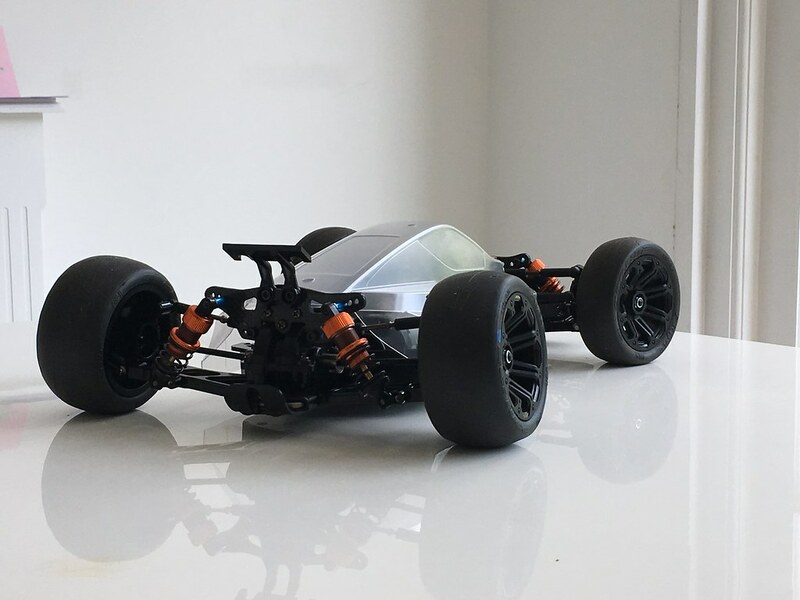 I also dropped the wing mount position relative to the body so it looks more streamlined than a standard Neo Scorcher, here the wing pokes up less than in buggy spec. Finally, I added a wedge in the wing mount to rotate the wing back slightly and make the wing slightly flatter to the ground plane, again to make it poke up less. I think you’re right, normally that’s exactly what I do. But I still am itching to try something else in addition to this shell. I went a bit mad trying out all these different colour schemes in my head... I have never looked at so many race car pictures in my life....! @ALEXKYRIAK BRAVO! BRA-*******-VO. That is brilliant. Love the custom bits and that body looks brilliant all low and fully covering the tub. 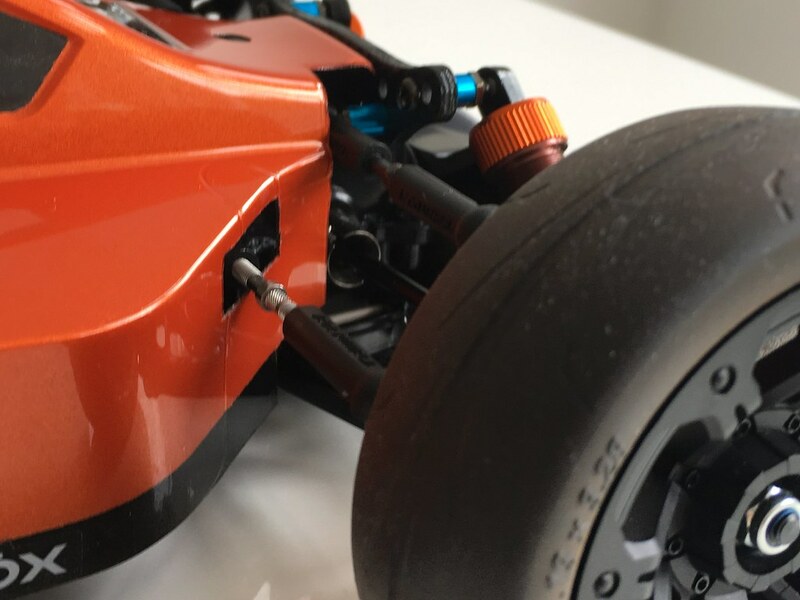 The cut out for the steering link is inspired and full F1. Colour is amazing and I really don't think it needs decals. 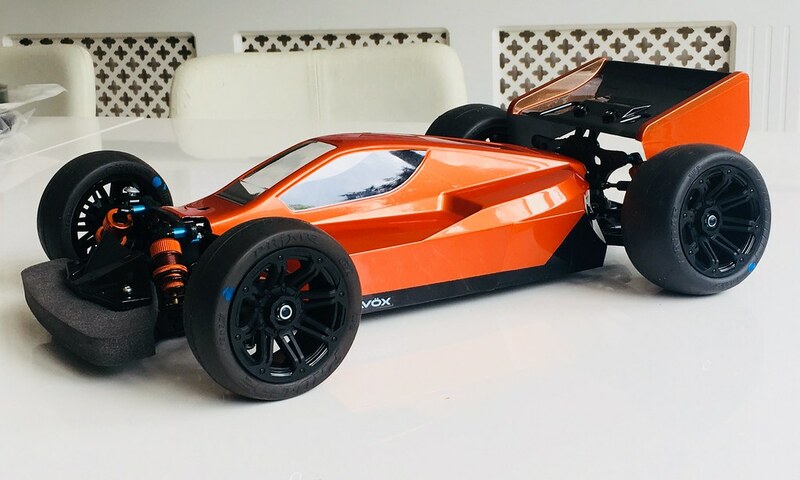 Looks pure and clean and fast. 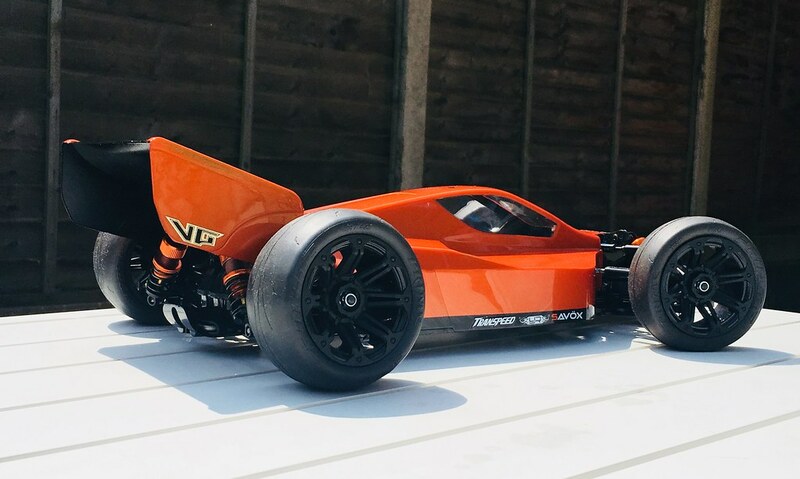 My mate has told me about people running slammed hot shots on foams indoor back in the day. Always thought that sounded mint and this is a modern interpretation of that. I bet it's ace to drive. Also v jealous of your 10.5MMM motor. Would love to get my hands on one of them. That looks awesome Alex. Massive kudos for that. I want one. It looks fast just sat there. Thanks @ThunderDragonCy, I’m really chuffed you picked up on the F1 vibe. I spent hours looking at the shell and test fitting before committing to scalpel and body scissors. 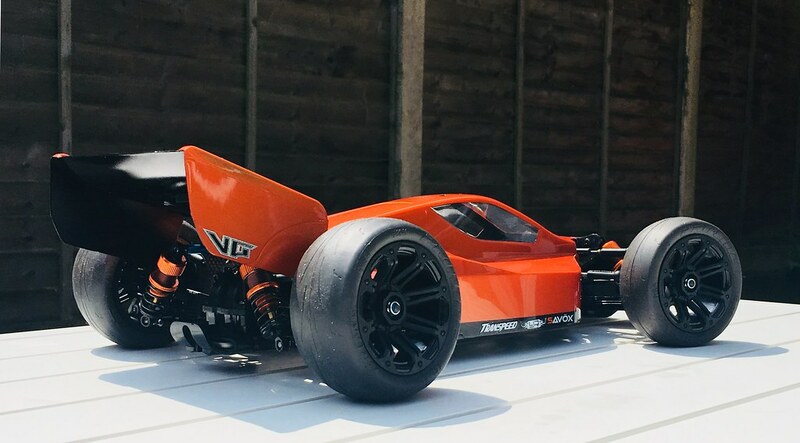 Building this makes me want to get an f1 kit. I picked up the 10.5 from Modelsport a few months ago. 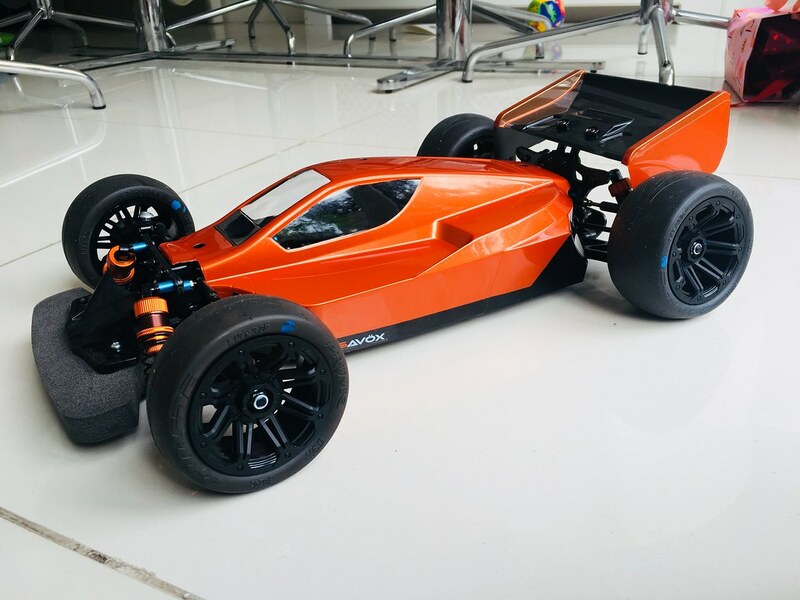 I should have mentioned in the post above that this car is running in 4WD spec, metal gears to the rear and kit plastic gears to the front . 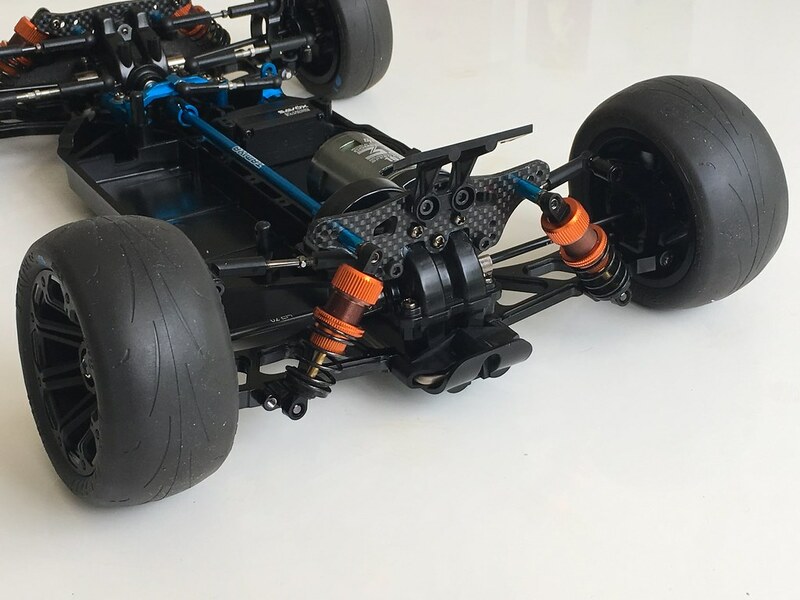 I seriously considered making it RWD only but in the end didn’t go for it, partly due to not satisfactorily working out the proper way to install the front end - I guess a standard DT03 style axle would have sufficed for the fronts in retrospect . Interesting to hear about slammed hotshots. Is/was this a scene? Will need to look it up. I remember seeing a really cool Hotshot from @svenb last year in Lucky Strike colours and if I recall that was pretty low and slinky. Looked awesome. I think he has it in his garage. Am now in two minds about decals.... quite a few of you are saying leave it clean...! Thanks mate, yeah I always felt that this body was not the most beautiful, but with the right stance and composition could actually look quite streamlined and quick looking. 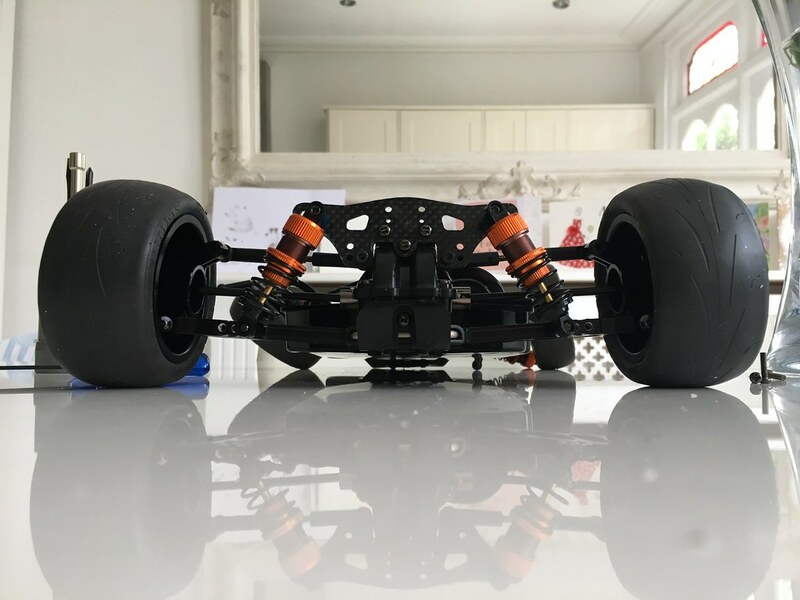 I think it can look quite good in the right stance, and as you say in this configuration it looks quick whilst sitting still. I will tinker a very little with the rear wing also I think. Don't know if it was a scene. My mate used to run at a club in a sports hall in Nottingham in the 80s. He talked about the slammed buggies when i brought my Thunder Dragon into work a few months ago. Great buggy, and I'm glad the orange is growing on you. I see lots of body shell features and interesting color variations when that color is put in direct sun. I think somebody else has posted pictures of a lowered Madcap before, too, and it looks great as well. Awesome! All the choices you made seem spot on, looks mean and I bet will handle very nicely! It's making me want to go a similar direction with my Boomerang kit. Ooohhh. Very, VERY, nice! 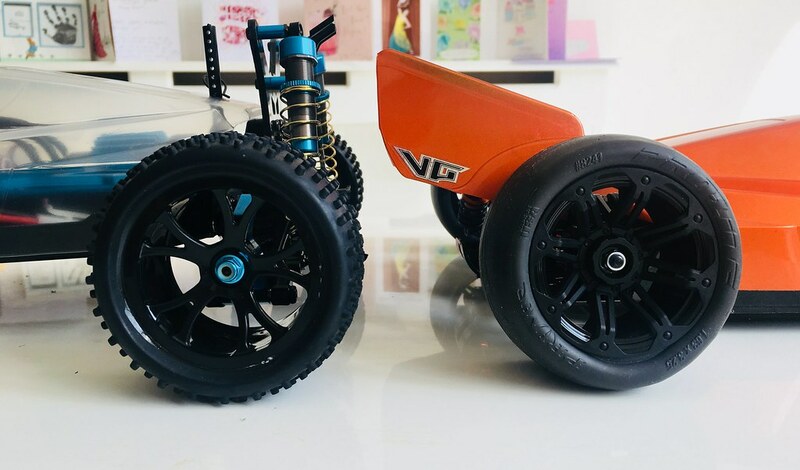 I gotta say that colour looks good and I'm loving the wheel/tyre combination... it almost makes me want to build one for myself! So if someone wants to buy those shock towers how does one go about that? I don’t mind sharing the file with you or anyone else here (just don’t go selling them!). PM me with what you want to do and I can give you the details. I would love to see that! Depending on how this goes, I may try this again in the future with a boomerang or Hotshot. 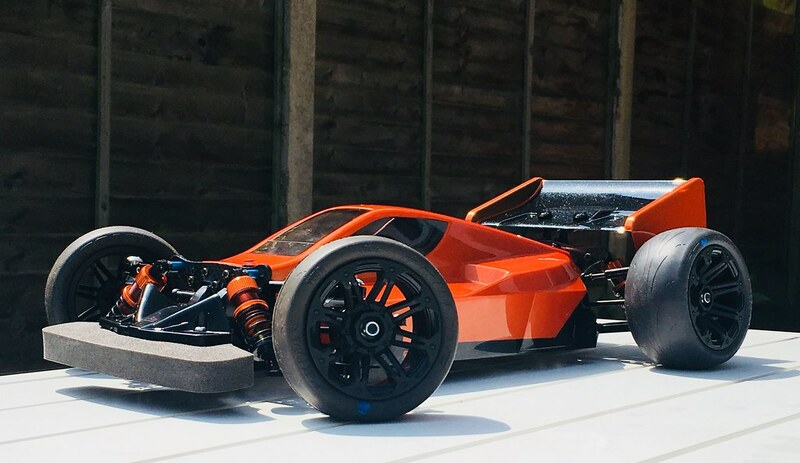 I think an Avante would be awesome with this treatment but it’d cost a lot... it’s very tempting, particularly with that bodyshell and the carbon chassis. Mint! Spacers inside the shocks for ride height and touring car springs was the old school thing apparently. There's just something about these buggies that look so sweet lowered with street tires on them! 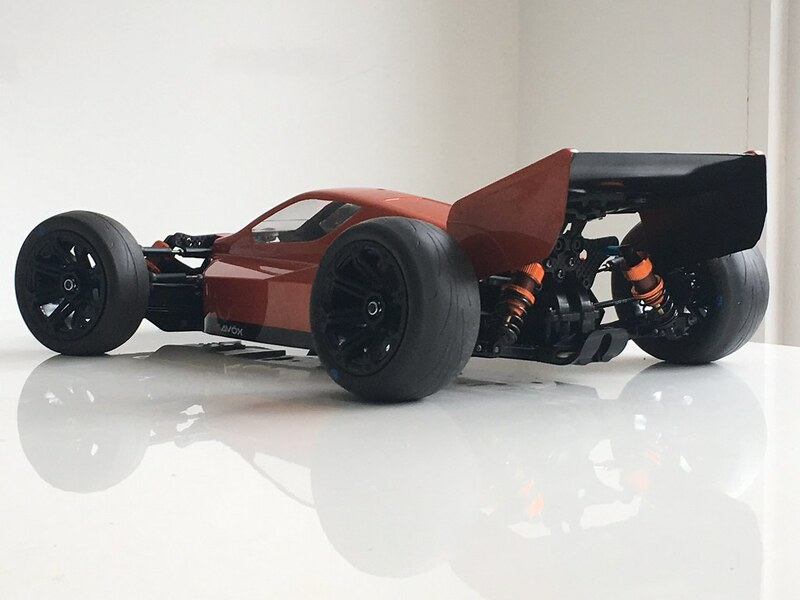 This whole time we were all complaining about how low the TT02B sits while trying to get more ground clearance out of it. It looks amazing lowered down like that. Nice work. 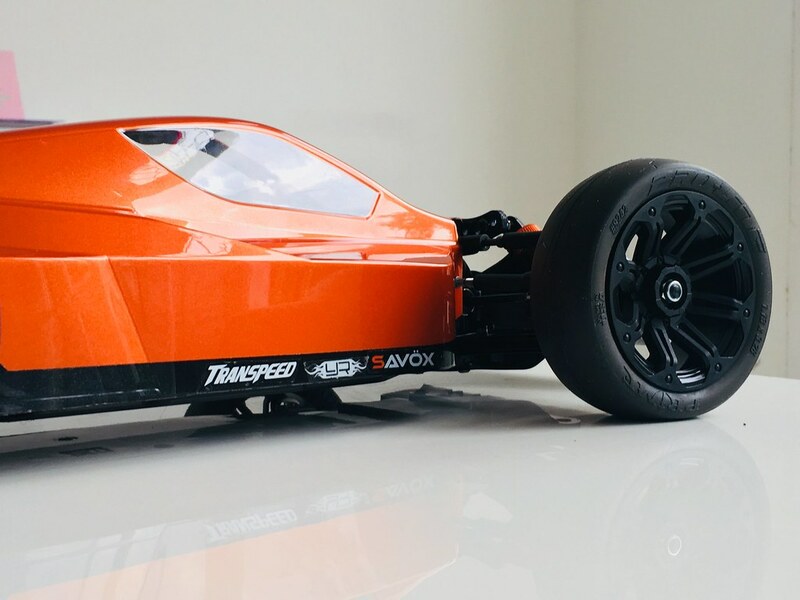 I am now very tempted to get a 3rd TT02B just to mimic this build. Awesome. Sorry but that looks ridiculous ........ Ridiculously amazing !! , Haha that is very cool indeed. Have you run it yet?